If you're using ARION's coaching AI, you don't need to set anything up. After having done your baseline session, the system will automatically suggest a certain running parameter to focus on based on your own running data and injuries (if any), and will already set recommended target zones for you to follow. If you prefer, you can also take full control and override the AI coach by setting up your own technique run manually. Open up the ARION app, log in and, in the dashboard screen, tap 'Start a run'. If you've never done a baseline run we recommend you do this first, but this is not obligatory. 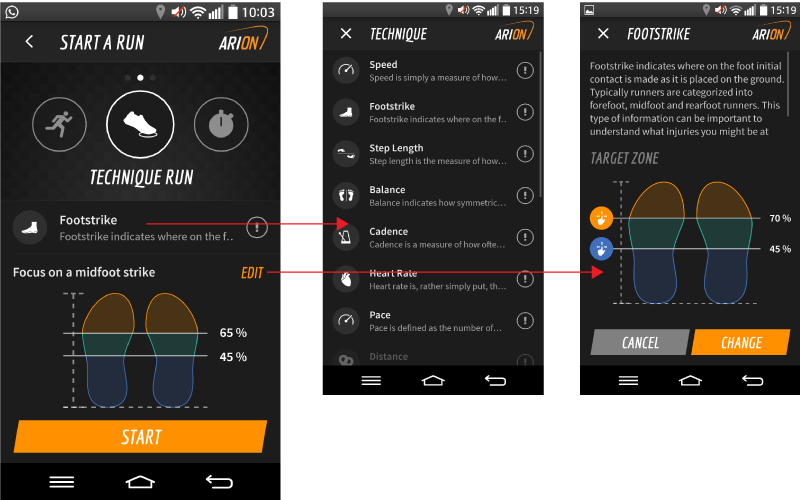 Swipe over to the 'technique run' section, where you can set a focus metric and the target zone you'd like to use. If you'd like to change the parameter to train on, simply tap on the parameter name and select a different parameter from the list. Then for the selected parameter there is a target zone set up. For whatever parameter you have selected (footstrike in the example below) you can change the target zones. To do this, tap the orange 'Edit' button. In the screen that pops up you can adjust the sliders according to your preference (the orange slider being the upper limit and the blue slider being the lower limit. Tap 'Change' to save the target zone. Now when you hit 'Start' you will start your technique run. You will be focusing on the parameter you have selected, and will receive real-time audio feedback on the target zones you have set. And there you have it, a fully flexible technique run feature! You can do the same with any of the other parameters such as step length, cadence or pace. Technique run finished? Let's dive into the analysis of your run.